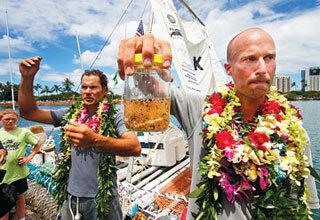 Joel Paschal, right, and Marcus Eriksen sailed for almost three months and covered 2,300 miles, from Long Beach Aquarium in California to Honolulu, aboard the Junk raft, which is made of 15,000 plastic bottles and a Cessna 310. The voyage was made to bring attention to the increasing environmental problem of plastic debris in the Pacific. Paschal held up a jar yesterday filled with plastic debris that they collected.